Hans let carve about wide travels and buildings, mainly the Globe. 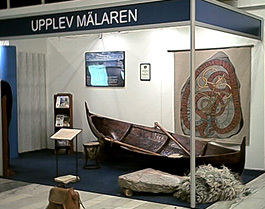 Early spring 2001, I participated in the Association of Lake Mälaren booth at the Boat exhibition in Älvsjö, south of Stockholm. 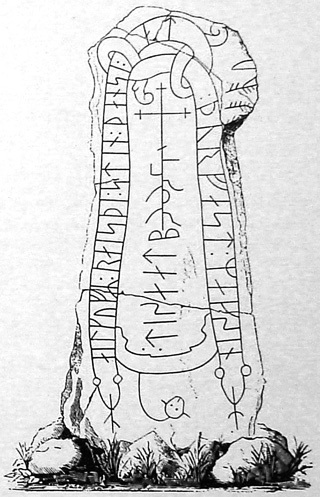 I would work with a rune stone related to water and shipping. 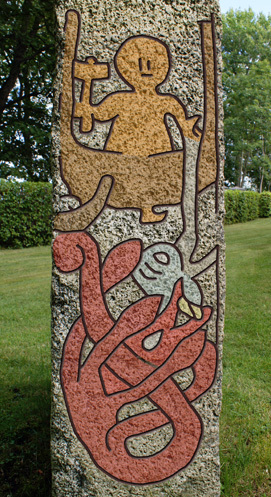 After a period of thinking, I chose to carve the Norse saga of Thor's fishing trip. (Read the saga at the bottom of this page). 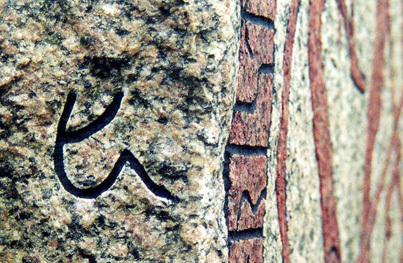 After the exhibition, I continued work on the rune stone in my rune stone shop, then located in Hovgården on Adelsö. There discovered Hans, engineer and builder of including Globe Arena in Stockholm, he saw the opportunity to make a lasting memorial to his works, and he got it. Out of all the runes I chopped up to today in 2014 this is my favorite and it's the giant Hymer in the stern of the boat that makes it. I had difficult to form the giant. Size and expression was very important and I could only use a few lines / stab tracks. 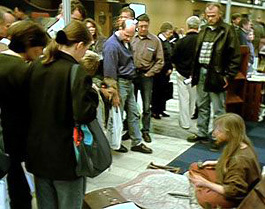 The Giant was the last thing that was carved into the rune stone. 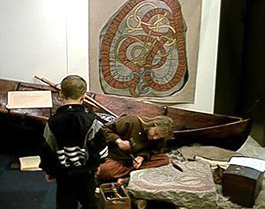 The Birka museum boat Våga was in the booth, new tarred. Almost empty of people and I'm starting to carve. The carving sounds good. Soon I amassed a sizeable audience. and then comes the curious questions. One day Thor was traveling Jotunheim, the land of the giants. He meets the giant Hymer that challenge Tor on fishing competition which Tor accept. When Thor asks what bait to use Hymer answer to that, you had to organize that yourself. When Thor goes out into the giants paddock and selects Hymers best ox called Himinjod and chopping his had of to use as a bait. When everything was ready for departure took them Hymers boat and rowed out to sea. 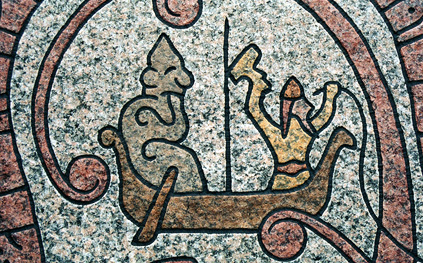 After a while, the giant thought that they had rowed far enough but Thor continued to row. 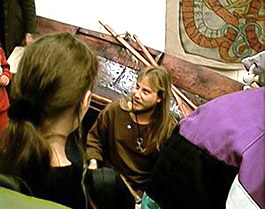 Now Hymer became worried and pointed out that soon they were so far out that they approached the Midgard Serpent dragon. 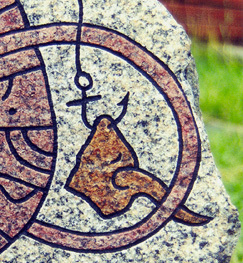 When Thor well stopped and started fishing the giant became even more worried, Thor now baited with the ox head directly on the anchor and the giant began to understand what it all was about. Thor threw out the anchor with the ox head on. After waiting a while Thor felt that something took the bait, he began to haul in the catch, the Midgard dragon. Thor pulled and pulled, he braced against the railing and the floor, put his feet hard in the bottom of the boat, so hard that it broke and foot got right through the bottom. 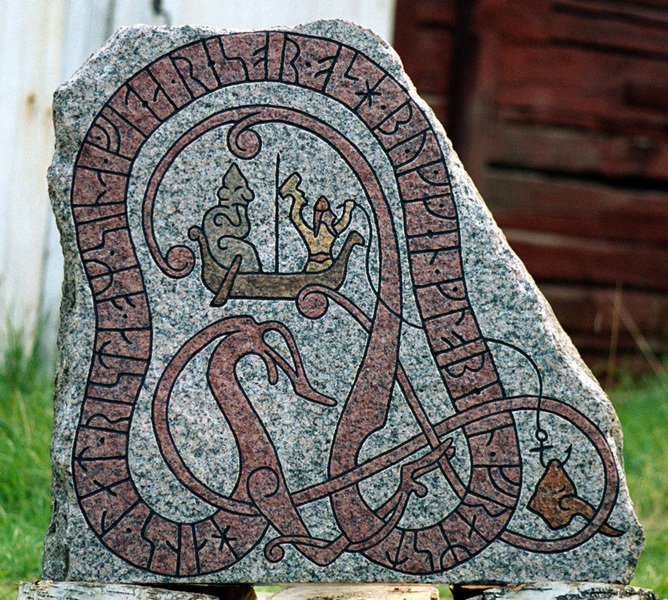 Finally Thor got the Midgard dragon above the surface, he swung his hammer Mjolnir to crush the head of the dragon... but the terrified Hymer then jumped up and with his knife he cut the anchor line. And the Midgard dragon sank slowly back into the depths of the ocean. Now Thor became furious and beat Hymer so hard that he fell overboard and got to swim all the way back home to Jotunheim, where all the giants live.